Today’s the day! Time to announce the three (out of some 1400+ folks who signed up) winners of the Inspirations Embroidery Kit Give-Away! Let’s jump right to that, and then I’ll share some news of what’s coming up on Needle ‘n Thread in the near future. Of the three winners who were selected by a random number generator, two chose Allison Cole’s goldwork honey bee, above. The third chose this Modern Crewel kit that I reviewed several weeks ago. Originally, I was planning to track the answers to the question which kit would you choose, to see which embroidery kits proved most popular on the Desirability Scale, but there were too many entries to keep up with it. The Honey Bee and Modern Crewel would have definitely been in the running for top spots, though. The three winners below need to contact me within three days (by Thursday, August 4) with mailing information. If I don’t hear from you, I’ll have to select a different recipient. 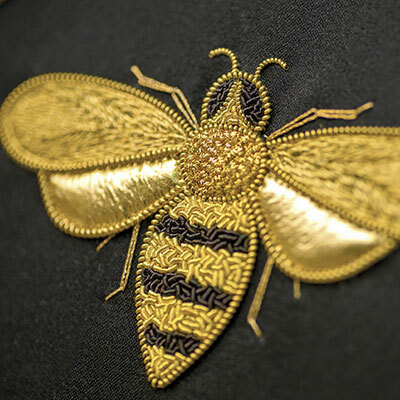 I would like to win the Goldwork Bee kit, because I have always wanted to learn this form of Embroidery ever since I saw the Royal School of Needlework students working Goldwork on a Heraldic Coat of Arms at the London Museum. Probably the honey bee, because I have never done gold work before and I would love the opportunity to try it. That, and I had my mother looking over my shoulder while looking at the webpage and she just loved the bee! (Well, she liked everything but she liked the bee best). Oh the choices! As is usual, my eye is drawn towards the vibrant colors that splash across the Modern Crewel kit. I’m a sucker for the flashy. Inspirations Magazine – New Issue Out! Thanks to the folks at Inspirations for providing the kits for this give-away! I thought it was heaps of fun – and I loved reading your answers! Just so you know, a new issue of Inspirations Magazine is out. And that means that there are new kits available for the current issue. There are still a few kits available from past issues, including Modern Crewel, the Honey Bee, and the Chatelaine kits, all of which were really popular in the give-away answers. I had a gloriously newsy Needlework News Snips article for you on Saturday, but I had no internet service until late in the day, thanks to a whopper of a storm that took out the router here at home. So Saturday’s article didn’t get published, but I’ll make up for it eventually! 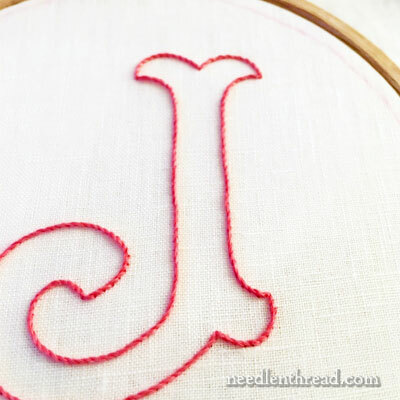 Above is the starting point of a simple, quick monogram project, using the Bold Plain Letters from Favorite Monograms. It was my weekend stitching project, and it fit the bill perfectly – relaxing and easy, with fun results! I’ll be sharing tips and techniques on that little project later this week, for those of you who have purchased the e-book and want some ideas for those letters. And over the next several weeks, I’ll be sharing instructions, tips, and techniques for different monogram samples from Favorite Monograms. Meant for beginners and beyond, the various approaches I’ll be showing you are lots of fun and easy to adapt, even to embroidery projects that don’t involve lettering. The kaleidoscope project that you all helped me name is all stitched. I’ll share the finish with you soon. And in August, you’ll see the launch of my beautiful new (and mobile-friendly!) website design for Needle ‘n Thread! I’ll let you know before the launch, so you know what to expect. It’s another blissfully hot and humid week here in Kansas – perfect indoor weather for getting a lot of stuff done in the work room. I’m looking forward to sharing it all with you! April 6, 2015 Hand & Lock Class Winner! July 20, 2016 Inspirations Embroidery Kits – a Grand Give-Away! June 10, 2013 Needle Tin Winners & Thanks! And the lucky ducks, Sarah, Eve and Anna. Congratulations on your fabulous wins. Congratulation to the winners of the Inspiration competition lovely prize I hope you all enjoy them. I can’t wait for the tips and techniques of the monograms great stuff and I can’t wait to see the finished and stitched Kaleidscopte project. I’m really looking forward to the new Needle’n Thread website sounds exciting. Thanks for sharing the news on your projects and for letting us know when the date of the new website. I have to admit, I am partly exited with what you are cooking up for the new website, partly afraid of what might change or what I have to adjust to. I use your site only from my laptop, and I am very much a creature of habit, so… well. Thanks for keeping us in the loop, all my best wishes for your week! Congrats to the winners! I’m envious of course, but hope they have a great time stitching their chosen projects. Thanks for the fun contest in addition to the normal great content. Congratulations to the three happy winners. I’m waiting patient for the kaleidoscope-news and how your website will change. Congrats to the winners! Lucky ducks. I hope they get hours of enjoyment from their projects.